According to the UBC student newspaper, the UBYSSEY, the University of British Columbia (UBC) is one of the largest bio-medical campuses in Canada. Each year, UBC’s Animal Care Center distributes some 100,000 animals, including cats, pigs, mice, rabbits, rats, non-human primates, and other animals to dozens of UBC-affiliated research projects. UBC maintains over thirty animal care facilities across its campus and throughout the rest of Vancouver. The Canadian Council on Animal Care’s most recent data shows the numbers of animals used in “science” in Canada have risen steadily, with nearly 2.3 million animals in 2008, up from less than 1.8 million in 1998. As the home of a rapidly expanding industry of animal experimentation, UBC is at the forefront of this trend. Stop UBC Animal Research has discovered that UBC researchers are conducting highly invasive experiments on animals. 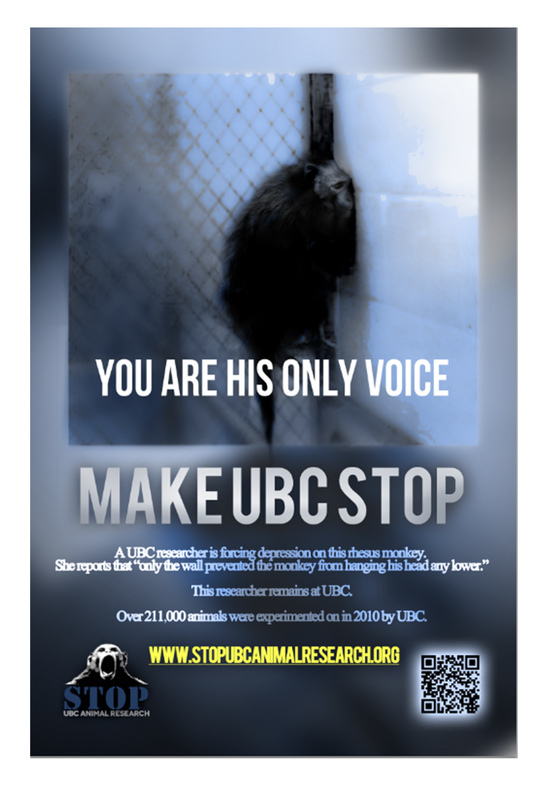 ALERT: Urge the University of British Columbia (UBC) to disclose information about its research on animals.